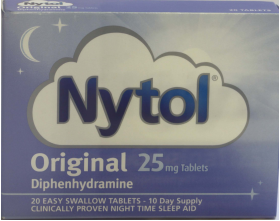 Minimum quantity for "Nytol Original 25mg 20 Tablets" is 0. Maximum quantity for "Nytol Original 25mg 20 Tablets" is 1. Nytol Original Tablets. 20 easy swallow tablets - 10 day supply. Clinically proven night time sleep aid. Each tablet contains diphenhydramine 25mg. Nytol is used to relieve temporary sleeping difficulties. Each Nytol tablet contains Diphenhydramine 25mg. Contains lactose - see leaflet for more information.